There are so many beautiful St Croix beaches that assembling this top 10 list wasn't easy. But here are our favorite beaches that keep us coming back each year! The Palms at Pelican Cove is constantly ranked as one of the top St Croix resorts by guests and I have a feeling that the beautiful beach has something to do with that! The sand is soft, the water is a clear blue, and there is great snorkeling around the coral reef just off shore. The Palms is just a few minutes away from Christiansted and there is no fee to enter. There is also a great restaurant just off the beach that serves breakfast, lunch, and dinner. And the bar serves delicious cruzan cocktails! If you're interested in fun water activities, the Tamarind Reef Hotel offers snorkeling equipment and kayaks that you can rent from the beach shack. The cabanas and lounge chairs are free for guests, but if you're just going for the day then you can use them for a small fee. 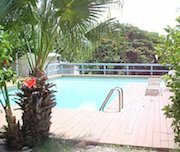 Hotel on the Cay is located right off the harbor of Christiansted. 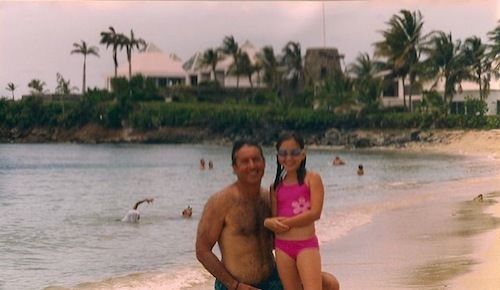 The beach has golden powder sand, crystal clear water, and amazing views of downtown Christiansted. The Cay is the perfect place to go when you're travelling with a family or group of people because there is something for everyone. Not only is the water beautiful, but there are so many fun activities, a great restaurant, and a cool beach bar! Click the link above for more information. 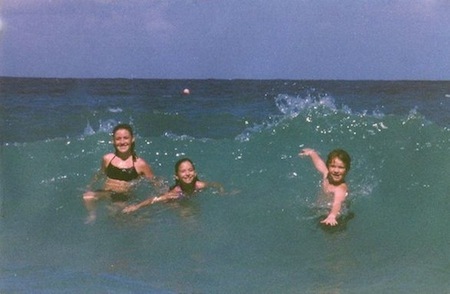 Rainbow Beach is my older sister's favorite of all the St Croix beaches. It is located on the West End of St Croix closer to Frederiksted (see St Croix map for more details.) The water is very calm and the sand is powder white and beautiful. The snorkeling at Rainbow Beach is great because there's tons of interesting sea life and the water stays shallow for a long distance. It took my family a number of years to discover Shoys Beach. It's right next to the Buccaneer St Croix Resort (where we go all the time) but we never knew Shoys Beach existed until someone told us about it. To get to Shoys Beach, you enter in through the Buccaneer Hotel’s entrance and then take a right into the Shoys subdivision. You make your way through the sea-grape trees and voila! - beautiful Shoys Beach. The sandy and grassy bottom make it the perfect swimming beach! The Buccaneer beach is great because there is so much to do! I have a big family of all different ages and the Buccaneer offers something for everyone. The beach is beautiful and has plenty of lounge chairs and umbrellas... plus the beach-side restaurant has really good food and quick service. Check out more information and pictures of the Buccaneer St Croix. 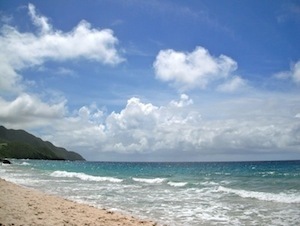 Carambola Beach is my family's second favorite "go-to" beach. The waves can be a little bit bigger here than at the other St Croix beaches, but that makes the perfect conditions for riding waves, skim-boarding, etc. Carambola Beach is attached to the Carambola Resort so there are lounge chairs, umbrellas, a restaurant, and other great amenities. Cane Bay Beach is definitely my family's number one "go-to" beach. We go to Cane Bay almost every other day when we are in St Croix. It may not be as breaktakingly beautiful as some of the other St Croix beaches, but it's still a great Caribbean beach with tons of fun St Croix activities. The water is always very calm, which makes it a great beach for young kids and unexperienced swimmers. 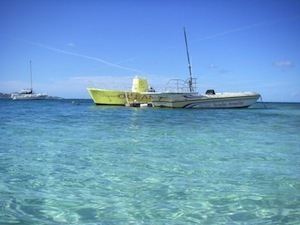 And if you're interested in St Croix snorkeling or scuba diving, Cane Bay is the place to go! Cane Bay Dive Shop is located directly across the street from the beach, as is a really great, casual restaurant. 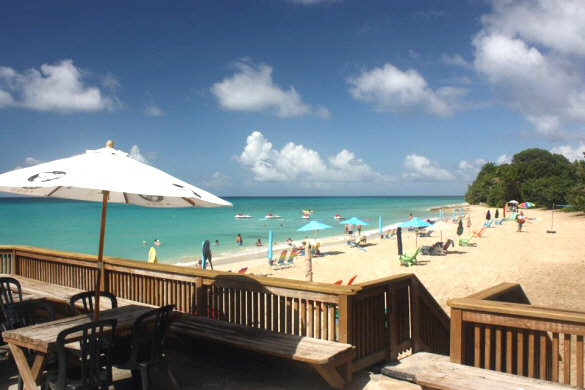 And the Cane Bay Beach Bar is one of the most popular spots for authentic Caribbean nightlife! Buck Island's Turtle Beach is truly the most beautiful beach I have ever seen. I only put it second because it's not directly on St Croix. Buck Island is an uninhabited island located right off the shore of St Croix, so you have to take a quick boat or kayak ride to reach it. Buck Island Turtle Beach (also called Buck Island Turtle Cove) is one of the best caribbean beaches you will find. It has white powder sand that feels like silk under your feet and the water is so crystal clear you almost can't believe your eyes! 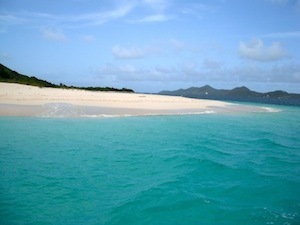 Turtle Beach is also a great place to go because Buck Island snorkeling is some of the best in the entire Caribbean! The Buck Island reef is a National Monument and both the marine life and the island are protected by the government. As a result, Turtle Beach looks like a beautiful untouched paradise. It took my family quite a few years of exploring and making friends with the locals before we discovered these two spectacular beaches! They are considered secret hidden gems of the island. Come to think of it, I hope St Croix residents don't get mad at me for sharing this information with you! ;-) But these two St Croix beaches are just too beautiful not to share! Getting to Jack's and Isaac's Bay takes a little bit of a hike, but it is well worth the effort! To get there, you simply park on the side of the road by Point Udall and then hike down the dirt road on the right. The first beach is Issac’s, which is beautiful on it's own. But if you continue on and hike over the small peninsula to Jack's Bay...the view will literally take your breath away! Jack's Bay looks like a picture from a Caribbean postcard! It's one of the best Caribbean beaches I have ever seen. The land is protected by the Nature Conservancy and guided hikes are also available. Jack's Bay is definitely my favorite of the St Croix beaches because it is so remote and picturesque. But, that said, there are no restaurants or other facilities on Jack's and Isaac's Bay so don't go here if you're looking to have lunch or lay on resort beach chairs. There are plenty of beaches that offer those amenities listed above though! 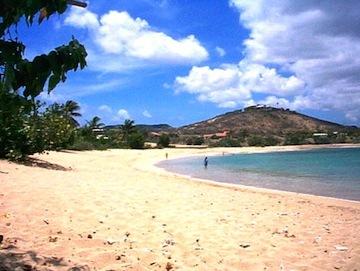 What's Your Favorite St Croix Beach? St Croix has so many beautiful beaches, each one unique in its own way. Everyone has their own special favorite. What's yours? 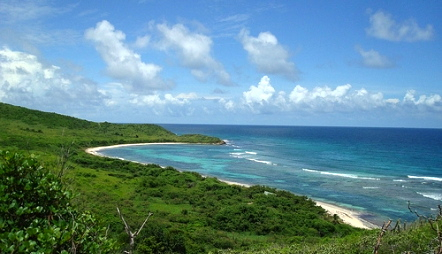 Click here to see the rest of the form and to share your favorite St Croix beach. 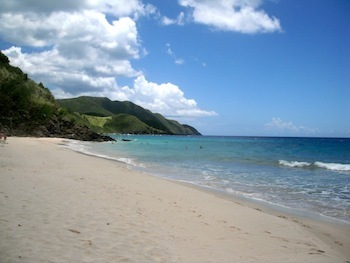 Click on the links below to read about other visitors' favorite St Croix beaches. Sany Point is my favorite spot anywhere... period. The sand, the view, the dunes, the water.... spectacular! !